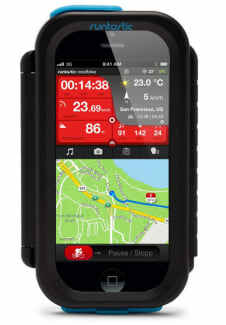 The Runtastic Bike Case, in combination with the Runtastic Road Bike or Runtastic Mountain Bike app, turns your smartphone into a professional cycling computer. The bike case is splash-proof and shock-proof, and will protect your smartphone from damage. On the top and bottom, the Runtastic Bike Case contains openings for connecting headphones or a battery pack. Navigating your smartphone functions easily through the transparent display screen, allowing you to keep your device safe and sound in the Runtastic Bike Case throughout your tour. With the included foam strips, you can customize the Runtastic Bike Case to your smartphone. Together with the Runtastic Bluetooth Smart Combo Heart Rate Monitor and the Runtastic Speed and Cadence Sensor, you can also track and evaluate your heart rate, speed, and cadence.